Raise your hand if you’ve been away from home – whether it be by plane, train or car – and required travel cots for babies. Hand up? If so, this portable cot is for you. The heavy lugging, the dreaded fifteen-minute assemble-and-disassemble routine and the “this will never fit” thoughts are all a thing of the past with this nifty invention by trusted company Baby Bjorn. 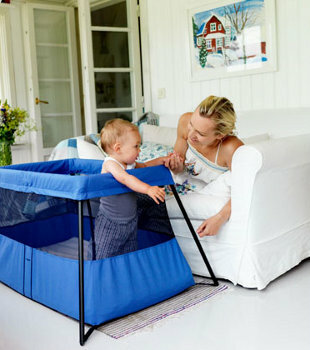 Called the Travel Cot Light, it lives up to its name weighing only five kilograms. It comes with its own carry case that’s made to be transported easily by hand and can be checked in with your other luggage when flying. The little details are all synonymous with Baby Bjorn quality: a waterproof mattress; fabric made to Oeko-Tex standards (no chemicals, child safe); a sturdy and safe design; the fast one-handed assemble and disassemble. Available in blue and silver, the Baby Bjorn Travel Cot Light is sure to provide many hours of perfect slumber for your little one. You can purchase it from many large baby retailers in Australia as well as online from Minimee Babies & Kids.